PLEASE SEE THE FULL ARTICLE FROM THE DAILY TEXAN! 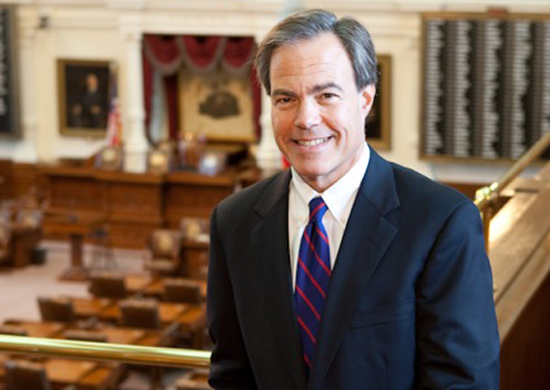 The Associated Press reports that a new right-wing PAC, Accountability First, is targeting both House Speaker Joe Straus and allies in upcoming Republican primaries, in a rather transparent attempt to make the Texas House an even more right-wing chamber. Specifically, Rep. Byron Cook (R-Navarro County) and Rep. Jim Keffer (R-Eastland County), moderates and Straus allies, have seen their respective primary opponents be heavily funded by this PAC. The PAC is largely underwritten by Wallace Hall, the embattled UT Regent on an alleged witch hunt against UT-Austin President Bill Powers. Hall is, of course, currently being investigated by the Legislature for abuse of office and possible impeachment. Also a heavy benefactor to the interest group is Jeff Sandefer, a longtime Perry adviser. Sandefer is probably best known for heralding many of the more-controversial education reforms in the right-wing’s playbook. Specifically, some of the aversions cast upon him are his alleged desire to turn schools such as the University of Texas into more of a technical/vocational institute. As much as the omnibus anti-abortion bill seems to be all the rage these days, there is other stuff going on at the Legislature. Specifically, in addition to abortion, Gov. Perry added two more issues to the call: Transportation and Juvenile Criminal Justice. The same other two issues that were dealt with in the last special session. The houses came very close to passing comprehensive legislation on Transportation funding and Capital Murder penalties for juveniles last special session. However, these bills were caught as collateral damage in the ultimate day’s filibuster. Like the abortion bill, these issues’ bills have been given new names to reflect the new session. SJR1 is the new Transportation Bill and SB2 is the new Criminal Justice bill. The Texas Tribune reports that both passed unanimously through committee today. I have talked at length about the bills debated by the Legislature to create suitable (constitutional) penalties for juveniles convicted of capital murder. I have colloquially styled these the bills about “Miller compliance.” Last session, the Senate passed a bill which replaced the mandatory life-without-parole penalty (that was deemed unconstitutional) with a life-with-parole penalty. The House amended the bill to include the option of life-without-parole for the more heinous offenses. The bill that the Senate Criminal Justice Committee passed today, SB2, does not include that amendment. The vote was unanimous. The Transportation measure, SJR1, which must pass with a 2/3 majority and then be approved by referendum this November, passed the Senate Finance Committee unanimously as well. That bill, which diverts over $1B from the Rainy Day Fund to the State Highway Fund, is identical to the measure nearly passed last Special Session. Both of these bills are somewhat non-controversial, and should be passed by the Legislature ASAP. Contrary to public belief, these bills were not taken hostage by the Democrats. In fact, the Republicans made the strategic choice to kill them. Any honest follower of last week’s proceedings will remember that Kirk Watson stood up and said that the Democrats did not object to taking a final vote on the two bills before the SB5 filibuster occurred. Oh well. Then, of course, this happened. Starting at 3:30 today, the House State Affairs Committee held their obligatory public hearing on HB2, one of the successors to SB5. As I stated yesterday, Committee Chairman Byron Cook made clear that public comment would only run from 3:30PM to Midnight. With 3,543 people signed up to testify, after getting started a little behind schedule (what a surprise), the Committee barely made it through 100 people before Cook took the unilateral, though not unexpected, step of cutting off public comment. Shortly after Midnight, without much warning, Cook abruptly ended the debate and took a vote. 8-3, along party lines in favor. However, the vote was taken so quickly that two Democrats could not return to the desk. Accordingly, the real vote should have been 8-5. Shortly thereafter, the Capitol got cleared and locked down. The result, in the above photograph, was roughly 1000-1700 angry protesters banging on the doors to their place of government while 7 White Men and 1 White Woman, in the dead of night, passed punitively burdensome restrictions on the right to abortion. At roughly 2PM today, the 83rd Legislature convened for their second Special Session. However, what happened at that time was not the biggest news of the day. Instead, the biggest news was what happened at High Noon at the Capitol. The Stand With Texas Women rally occurred, and saw an astronomical amount of people show up to oppose the draconian measures. I just heard Sen. Leticia Van de Putte on MSNBC say that “Eight thousand” protesters showed up. Wow. The Texas Tribune has an entire slideshow full of the festivities that occurred today. The rally included a local Austin band, Bright Light Social Hour, as well as Natalie Maines, a former member of the Dixie Chicks. An actress, Lisa Edelstein, also made an appearance. Those politicians you would expect to speak also made statements, one by one. Senfronia Thompson, Jessica Farrar, Lon Burnam, Kirk Watson, Leticia Van de Putte and Wendy Davis, to be exact. Cecile Richards also made another appearance, and gave another speech. The rally was a big deal, to say the least. Then, the House and the Senate gaveled into session. Shortly thereafter, they gaveled out. Until July 9th. This drains the clock on about 25% of the Second Special Session. However, the notion that the legislature adjourned for a week is slightly misleading. This is because, while the full House or the full Senate will be out of session, Committees will be free to operate as needed. In a little bit of review, let me note that the omnibus abortion regulation bill will be heard in the House State Affairs Committee and the Senate Health & Human Services Committee, respectively. Tomorrow, the House will hear its omnibus abortion regulation bill, HB2, in committee. The Austin American-Statesman reports that this hearing will take place at 3:30 on Tuesday. However, flying straight in the face of House tradition, Committee Chairman Byron Cook will be cutting off testimony promptly at midnight. As many may remember, Cook has done this once before. Expect the hearing to be messy. Very, very messy. In other news, broadly related to this ugly legislation, Texas Leftist has an awesome piece on how the Democrats were able to expose the Republicans’ extremism and hypocrisy on the subject. Most notably, after holding a largely successful “Citizens Filibuster” into the wee hours of the morning yesterday, the House State Affairs Committee adjourned without voting on the Omnibus Abortion restriction bill. However, the committee quietly reconvened today and voted out the bill. The Austin American-Statesman reports that the hearings on HB60, the equivalent of the Senate’s anti-abortion bill but also including the 20 week ban, extended until 3:40 in the morning last night as nearly 2000 women showed up to testify against the burdensome regulations. I was in meetings all day today, so I never had a chance to be on the first people writing on this. Off the Kuff, Texas Leftist and Brains & Eggs (who spelled my name right, yea!!!) have much more on the topic of the filibuster. The bigger issue, unfortunately, is that it didn’t really mean much. The Texas Tribune reports that the State Affairs Committee approved the bill anyway. However, there is actually quite a lot to discuss on the actions by this committee. The committee not only approved HB60, which is different than the Senate’s bill (SB5), but they also rubber-stamped SB5 itself. This means the legislation goes straight to Perry if the full House votes favorably upon it. However, in one shining glimmer of hope, the Tribune article notes that there may have been a Point of Order violation when Chairman Bryan Cook cut testimony short. If Turner and his gang can P.O.O. the bill, that would be fabulous. I have always maintained that this bill would be unconstitutional and summarily thrown out in Federal Court. Last but not least, I thoroughly recommend watching Rachel Maddow’s thoughts on the matter. Jessica Farrar joins her as the guest (TX @ 6 min; Farrar @ 14 min). Though I can’t find an article for it, I know that the House third-read passed the redistricting maps. It’s a done deal now. Finally, in an exceedingly bizarre series of events, the Austin American-Statesman reports that Sen. John Whitmire alleged that Governor Perry vetoed one of his bills, SB1234/Truancy Reform, by mistake. The article opened the idea of Perry calling a mea culpa on the matter, and the Legislature summarily re-approving the legislation in the final days of the Special Session. However, in the recent update to the article, Perry reaffirmed it was not by mistake. Even if it was (it probably was), there is no way he would ever admit to it, it would make him look too bad. Whitmire claims he had some good sources, but as our Editorial Board says, he isn’t always to be trusted. I was supposed to meet with Dan Branch today, but Special Session needs came calling. I did get to see, in unrelated news, a mock trial being put on by Dallas County. It was the hypothetical “Trial of Lee Harvey Oswald.” After a very, very, very short trial for Capital Murder (three hours), a jury of Dallas’ judges deadlocked 9-3 in favor of guilt. It will be in the news soon enough, and you will probably see me in the video (I’m in the second row).